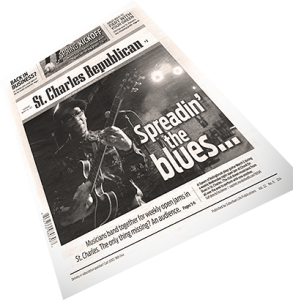 Once a blues oasis in the western suburbs, St. Charles’ Chord on Blues had legends such as Koko Taylor and Buddy Guy grace its stage over the years. After going through a closure and a management change, blues legends who once played there may be 40-plus miles to the west in chicago, but the blues is back in St. Charles. On a recent Wednesday night at Chord on Blues, a local mason named Mike Hoge walked across stage in a brown leather jacket equipped with a Rolling Stones pin and long hair, waiting for his bass player to arrive so they could start playing. “He’s never ;ate.” Hoge said, frantically making a call to make sure the bassist was still playing with the band, the Chicago Blue-Dadds featuring E.Z. Dave. Every Wednesday, sans holidays, for roughly the past eight months, Hoge’s hosted the Wednesday Open Jam, an event he created after using the space to practice with his old band. Hoge said about 50 misicians from across the state, even into Indiana, come play each week. “But a lot of people don’t know this is going on,” Hoge said, adding that the jam’s audience is mostly made up of his blues friends. He calls it a brotherhood and said they support and play at each other’s shows, everywhere from Oak Lawn to Berwyn to Chicago. Eventually, Hoge’s bassist showed up and hopped right on stage. The crowd was sparse, but eventually the bar and tables were filled with groups of people strumming guitars and holding drum sticks as they waited to get on stage. Hoge said drums, amplifiers and other equipment come set up for those who want to play. Musicians need only bring their guitars, bass guitars, harmonicas or drum sticks to get on stage. “Anybody can play – we’re open,” said Hoge, who added the venue has expanded beyond blues and anyone can play aby genre. Since the jam started, Hoge’s kept musician friends in the loop on when it was happening. He said it really started picking up in January when he and organizers started recording bands as they performed and gave them a tape of their performance. As hoge’s band started the night, Billy Rider, a teacher at Instrument Exchange in Batavia, sat in the back by the sound board to enjoy. He said he gets on stage some weeks, but its nice to kick back and watch once on a while. John “Clutch” Kargol, a Montgomery resident and drummer, said he’s been coming to the jam for about six months. He runs a jam in Chicago and said Hoge and others who perform at jams across the area have formed a bond over the music they love. 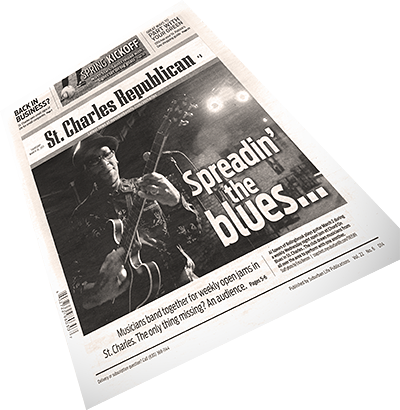 After opening in 1996, Chord on Blues has had its ups and downs. A letter from a former manager on an old version of the venue’s website said the club couldn’t keep taking losses and would only be doing infrequent shows. In 2009, the club opened a Facebook account and posted news about re-opening. Hoge said he convinced the new managers to let his band practice at the facility, and that soon turned into the weekly open jam. Now, the only thing Hoge said is missing is the spectators. He said it’s harder to get the older generation that enjoys the blues to come out, but he hopes that the word of mouth will soon make its way to the public. But Hoge said even though its harder for people to come out and watch, and even harder for older musicians with jobs and families to come play, heading to a jam once in a while is a good way to keep people in touch with the music they love. “They come out and jam, get their kicks out, let it loose,” Hoge said.” And then they go back to their jobs and families after they get their fix, Its a good way to keep players in touch with their instrument. Caption: Al Spears of Bolingbrook plays guitar March 2 during a weekly Wednesday night open jam at Chord On Blues in St. Charkes. The club draws musicians from all over the area to perform with one another. Caption: Dave Haines of Geneva sings and plays harmonica with a blues band during the weekly Wednesday night jams at Chord on Blues in St. Charles March 2. The club draws musicians from all over to perform with one another.